Friendship Circle has had its first official game. The team, whose 14 teenage and young adult players have special needs, had practiced for seven weeks in basketball clinics that are part of the group's Teen Scene program. Its opponent was the Jaguars, a group of middle school kids from Joseph Kushner Hebrew Academy. Played this month at the academy, the game was a big day for Friendship Circle coach Bob Wasilak and his players. Scene Basketball League" in their first official game on March 16, 2009. But it was just as big for the group's parents, who got to see first-hand as their children — some of whom have autism or Attention Deficit Disorder — developed self-esteem, and for Jaguars, as they got an up-close chance to socialize. "Here, he really gets to practice and be himself," Susan Helweil of Livingston said as her 17-year-old son hit the court as Friendship Circle's captain. "Here, Eric can be Eric, which is very nice." Ever present during the face-off was Rabbi Zalman Grossbaum, executive director of the Livingston-based Friendship Circle of MetroWest, now one of five such circles in New Jersey and 65 worldwide dedicated to children with special needs and their families. The program is funded in part by the Seryl and Charles Kushner Family Foundation. "We were the first ones to create this," said Grossbaum, noting most of the circles direct programming at elementary-age children. "This is unique in many ways." the mighty Jaguars of the Kushner Academy. The Livingston group was the first to start basketball clinics, beginning three years ago. Since then, other Friendship Circles have started teams or are developing them, Grossbaum said. As the clock hit 4:30 p.m. on a Monday afternoon, the game started and Helweil gripped a red megaphone imprinted with the word "shout." Nearby, Dana Rappaport waved an orange pompom and cheered on her son, Jake, a 16-year-old who has autism. The mothers said they share a special attachment, reaching back to their children's speech classes as preschoolers. "We're very close," Rappaport said. "It's a bond that the parents have." Most of the Friendship Circle teammates have high spirits and move quickly up and down the court. For those who are overwhelmed by the movement, the rules and the noise, there is on-the-court support from teen volunteers. By the end of the first quarter, the guests are ahead 17-7. At the half, they're ahead 39-19. To Jacob Lefkowitz, a 17-year-old Livingston High School junior, volunteering on the court is time well-spent. "The greatest part is just seeing them accomplish something they might not otherwise accomplish," said Lefkowitz, who had to miss the big game to take the SAT. "There's nothing better in the world than watching that." game with high fives as their names are called out before they take to the basketball court. 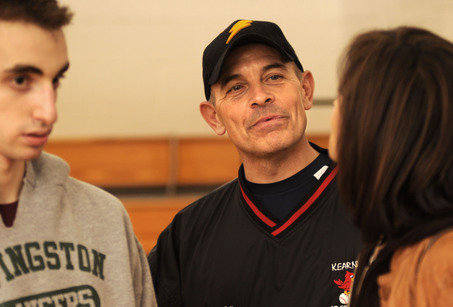 Seated on the bleachers, Stephen Waters, a physical education teacher at the Children's Institute in Verona, filled an occupational-therapist role to keep the players focused. 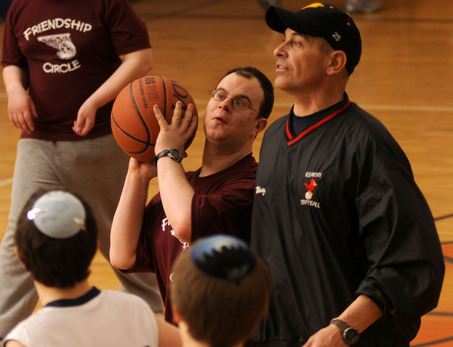 "My job is keep the students on task," said Waters, who coaches a special-needs basketball team at the institute that plays against the private Montclair Kimberley Academy. "Two of them are on my basketball team here." As the final minutes of the fourth quarter lapsed, the announcer spotted red-haired Scott Haller of Livingston making one of his signature plays for the guest team. "It's a steal!" the announcer said over the microphone to cheers. Before long, 19-year-old Avi Saunders, the team's center, landed the final shot in the final moments, topping off the Friendship Circle's 72-30 win over the Jaguars. The win was met with a lots of smiles, a lot of cheers. Even Craig Goodman, coach of the Jaguars, put a positive spin on his team's loss after a "tough season." His Jaguars had learned a priceless lesson. "Tonight was about kids seeing how things are out there in the world," Goodman said. "The kids were actually nervous, and they just figured it out. ... In a world where it's easy to be scared about our future, something like this gives you something to smile about."